The rich wine history of Cyprus has been alive and ongoing for something like 6,000 years. Take any of our seven routes to experience Cypriot hospitality and be introduced to the world of Cyprus wine. Visit any of the 41 modern wineries that presently operate on the island and taste their wines. Agrotourism and other small units, tavernas and restaurants with high modern standards are here to provide you with accommodation and the unique dishes of the Cypriot kitchen. Go back in time by visiting restored traditional wine presses and museums that demonstrate the life, culture and traditions of the rural population. See the grape harvest, join traditional feasts and enjoy superb local wines in abundance. 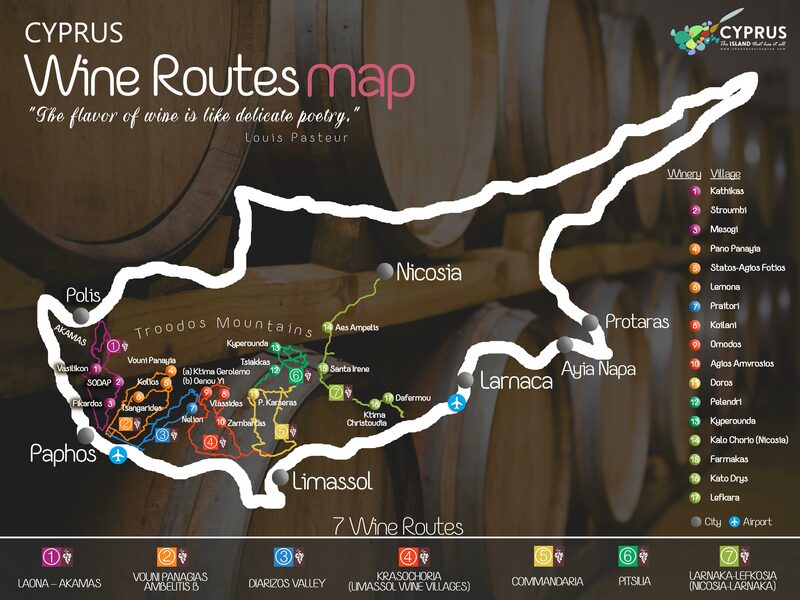 The Wine Routes programme has been implemented by the Cyprus Tourism Organisation with co-funding from the structural funds of the European Union for the initial six routes and by the European Fund for Agricultural Development for the seventh. An alluring and captivating region with rugged coastlines, gorgeous and tranquil countryside, charming small villages imbued with culture and tradition, blossoming vines blended gently in with contemporary elements. These lovely quaint villages are an open invitation to their vineyards- villages such as Ineia, Pano Arodes and Kathikas which lie on the western shores of the island. ‘Xynisteri is a native to Cyprus grape variety that thrives in the Cyprus climate with its sea breeze producing full bodied white wines, among the best on the island, with a delicate aroma and a refreshing taste. Among the best of our red wines is the rare Maratheftiko, which you can also find along one of the wine routes on offer. The Vouni Panagias – Ambelitis route lies on the western part of the island in the district of Paphos at an altitude of 2,400 feet above sea level. You will travel through a beautiful landscape sampling the delightful locally produced wines. There are numerous wineries here producing white wines with a taste of peaches, green apples and apricots with a distinct delicacy and aroma. The other native to Cyprus grape is the Maratheftiko variety. Made from red fruits, roses and violets this sumptuous red wine is also cultivated here. In the high altitude villages along this route including Vouni Panagias, Chrysorrogiatissa and Agios Fotios have a sample of the best Mavro grape wines, another local grape variety producing delicious dark and rose wines. Travelling along the Diarizos river, this route is encompassed in beautiful untouched greenery dotted with lovely vineyards and peace-inducing scenery. The Diarizos valley is less well known in comparison to other wine growing areas, as it sits at a far lower altitude. Although it hasn’t been at the forefront in recent years, things have changed. The introduction of modern vine cultivation in numerous small wine making units that have been created have transformed this region in to a competitive wine making area which holds good promise for the future. Encounter the warm hospitality of the locals among the tranquil landscape and enjoy the wine in friendly company and pleasant environment. These are renowned wine villages, perhaps the most renowned on the island. Lying amongst enchanting scenery, this is a stronghold of traditional wine making. Found in the Limassol district, they are known as the Krasochoria, which in English is translated ‘wine villages’. The Krasochoria have the greatest concentration of wineries on the island. Koilani and Omodos are a few worth mentioning. This route is truly unique compared to the others. Take in (apart from the wine) the charming village scenery with its traditional architecture, cobblestone passages and sample the traditional Cyprus cuisine in some the best taverns on the island. A trip that takes you back in time, to the secrets of the island's most ancient and famous wine, the world famous Koumandaria. The fourteen koumandaria villages along this route date back to the 12th c. when the knights of St. John were producing and exporting it. One of the oldest named wines in the world, made from sun dried grapes to enhance their sugar content result in a sweet wine not dissimilar to sweet cherry. Visit the surrounding wineries in the protected zone as well as the centuries old Laneia wine press which has been refurbished. Worth visiting is the medieval castle of Kolossi, once the base of the Knights of St. John. Quaint villages with a welcoming hospitality as well as the charming countryside with its pine trees and vines invite you to have a good time. The villages in this area, including Pisilia, a winner of the Nom d’Origine, are spread around the mountain peaks of Madari, Machairas and Papoutsa. The high altitude and the geology in this area contribute to the quality of the grapes and subsequently the richness of the wine. The indigenous grape varieties found here dominate the vineyards- which is a good thing. The 7th and final wine route is located in the rural areas of Larnaka and Lefkosia, making its way through ten villages, and including three wineries, small museums and workshops. Even though it is outside the traditional wine regions, there are active winemakers here who have planted vineyards with the Assyrtiko, Malvasia Aromatica, Chardonnay and Maratheftiko grape varieties. The route also includes a visit to the very well known village of Lefkara, popular for its lace and silverware, as well as Fikardou where you can see one of the oldest traditional wine presses in Cyprus. Visit any of the 41 modern wineries that presently operate on the island and taste their wines. September is the traditional month of the grape harvest from the vineyards covering the rolling slopes of Cyprus. The vineyards are a hive of activity from March when the vines are pruned. Under the hot sun the vines have by now grown rapidly to the point where the grapes are now ready for harvesting. In Cyprus, harvest season runs from August to mid-November. So why not take a trip to one of these exceptional Choose your Cyprus selected wineries and walk their hilly landscapes, taking in the fresh mountainous air whilst savouring the best wines Cyprus has to offer? 1) Laona-Akamas: Beautiful locations and beaches, picturesque villages with rich cultural and wine traditions. 2) Vouni PanagiasAmpelitis: Panoramic route through mountainous terrain with an endless choice of local wines. 3) Diarizos valley: Idyllic expedition to the natural beauties of a relatively ‘unknown’, yet rich in vineyards, route. 4) Krasochoria of Lemesos: Well known wine villages, each with its own character, all with remarkable winemaking tradition. 5) Commandaria: Known and unknown corners that preserve the legend of the island’s most notable wine. 6) Pitsilia: Beautiful scenery along with excellent wine. 7) Mountainous Larnaka-Lefkosia: Superb locations with living traditions. Located in the village of Droushia, Ktima 1937 Kannides offers spacious and fully equipped apartments set around a free-form swimming pool with a large sun terrace. The stone-built Magdalous House in Arsos Villlage features a garden and a furnished terrace. It features a fireplace, beamed ceilings and iron beds. Free WiFi is available in all areas. Situated next to Miliou’s healing springs, Ayii Anargyri Spa Resort offers extensive health and beauty treatments, yoga classes and has its own beautiful vineyard.